This is the place to keep up with the latest announcements from the thINK Customer Community. 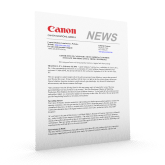 You'll find important information on upcoming thINK conferences, board member updates, and news from other Canon Solutions America customers. thINK 2016 aims to Inspire attendees with keynotes from Former Tennis Great Chris Evert, World Renowned Economist David Humphreys, and Existentialist Greg McKeown. The second annual thINK conference is set to reach new heights and instill creativity amongst Canon Solutions America Production Print Customers. 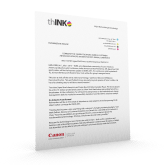 thINK, an independent community of Canon Solutions America production print customers, today announced that it has added a new member to its board. Todd Roth, Vice President – Core Publishing Solutions at Thomson Reuters will fill the seventh voting member slot. thINK, an independent community of Canon Solutions America production print customers, today announced that it has elected board officers and appointed a new conference chair for thINK 2016.
thINK, an independent community of Canon Solutions America production print customers, today announced that it has received overwhelming support and interest in its inaugural user conference. With more than 350 registered attendees, thINK 2015 is expected to be the largest customer-run inkjet group and one of the largest events in the world dedicated to inkjet. thINK, an independent community of Canon Solutions America production print customers, today announced that Phil Simms, NFL legend and CBS sportscaster, will be the keynote speaker at thINK 2015. The conference, held September 8-10, 2015 at the Roosevelt Hotel in New York, will be the group's inaugural event. Canon Solutions America, Inc., a wholly owned subsidiary of Canon U.S.A., Inc., today announced the formation of a community of Canon Solutions America Production Print customers. Called thINK, the group will hold its first conference September 8-10, 2015 in New York, NY at Canon Expo.